Reefing or reducing a conventional/non-furling mainsail can be done by way of either a slab or a single line reef system. Today I want to talk about the difference between the two reef systems and how they should be set up. When reefing, conditions are usually rough and frustrating. Take time to first make sure that you are safe and tethered to the boat (in position to perform the reef). Try and stay calm and think clearly about what you are doing, and what you are about to be doing. Ensure all leads are fair, ensure the boom topping lift has been snugged-up (this is very important), release the vang and then the main sheet slightly so as to just luff the sail. Now release the main halyard. Be sure to pay out enough halyard so that the reef is actually below the boom. If the wind is so strong that the sail won’t lower easily, make sure the halyard is still free to run and pull the reef line and/or jack lines at the luff slides to help lower both ends of the sail. Now, continue to tension the reef line (you should be able to do this without a winch) and tuck the inboard and outboard ends to the boom. Once the reef is tucked, double check to make sure all leads are fair and take the reef line to the winch and begin to tension it adequately. Lastly, tension the main halyard, loosen the boom lift and then sheet-on as needed. When the boat is stable again and everyone is settled in, safely, go and clean up the reef slabs. TIP: friction can easily be overcome by your winches, but be careful, because this is how things get broken! One is to ‘simply’ run a line from the outboard dead-end, up through the o.b. reef cringle, down to a sheave at the o.b. end of the boom, which will turn the line forward to another sheave at the inboard end of the boom, which will turn the line upwards to the i.b. reef cringle, then down through a fairlead on the mast to the deck and aft via a series of (you guessed it) more sheaves, then to a clutch, and finally to the winch (gasp!). In order to make things simple we, at The Rigging Company, prefer the first system – no shuttle blocks. Although this method does not offer any additional purchase, your cabin top winches will surely be able to overcome any load that you might encounter. For more information on leading lines aft, read here. Additionally, it may be advisable to hang small high load blocks from the sails cringles to reduce the friction further. Also if you are noticing that the inboard end is tucking sooner than the outboard end, hanging a block from the OB end only may balance the system out a bit more. 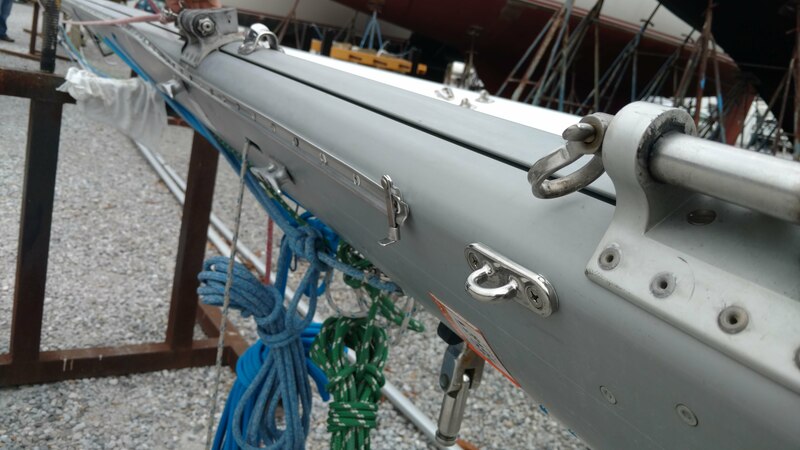 NOTE: For either of these systems to work efficiently the boom needs to have sheaves oriented in such a fashion that the line can both enter and exit the TOP of the boom. .
via Reefing Hook (see picture) or Cunningham. A good slab reef system should lead to a dedicated winch located either on the inboard-side of the boom, or just below the boom gooseneck on the aft face of the mast (see below). If the boat is equipped with multiple reefs, all lines should be cleated using rope clutches before the winch (anytime more than one line leads to a winch the use of rope clutches is recommended). 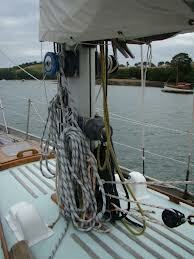 Leaving everything at the mast, properly rigged, will ensure the least amount of friction out of any reefing system. There are many variations and details in setting up one of these systems on your boat. Please consult with your local rigging professional to determine which set up is the best for you. Leave us a question in the comments below. We will reply! 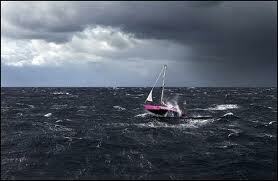 I live in New Zealand and sail in the Tasman and the Pacific which can be windy on occasions. I have a Beneteau Oceanis 50 with 3 single line reefs (In boom pulley cassette) Plus 2 cringles for reef 4. When reef 4 is needed it will obviously be blowing a bit. How do I rig a reef line to the clew cringle? Do I set up a reef line in advance (attached around the boom, up to the clew Cringle and back to the end of the boom and hanked there) The problem with this is a large hank of line hanging off the end of the boom. Fasten a reef line to the boom in the position where the 4th reef would come down too. Hank the remaining line there, Maybe a bungee to hold the hank out of the way. This reef line would be a lot shorter than the one in Option one as it would only be used when pulling down from reef 3 to reef 4. The problem being when the main is bought down to reef 4 cringles and put onto the tack hook the clew end will flapping around strongly and it would be very difficult to thread the reef though the cringle and back to the boom end. Happy Holidays! As this other article states, we would recommend that you lead the reef line aft (as I am sure the others already are) to accompany the main halyard. This is the safest, simplest and most functional method of adding a 4th reef in our opinion. Depending on how the boom is configured (e.g. available sheaves in and out-board) you may be able to run this internally for the cleanest look. Otherwise the addition of some cheek blocks, of course the line, fairleads and perhaps some additional blocks and a clutch maybe needed; so that it can be operated from near the main halyard (and boom topping lift in case there is no rigid vang present). In either configuration, internal or external, a true single line reefing system should be use (see the single line reefing diagram in the article above). We hope that this helps. Please feel free to send us some pictures of the boat in it’s entirety, the boom, and also the cabin top area from the mast, aft. Zooming out is always preferred. I am new to big boat mainsail reefing and wonder if you could explain that sometimes you see the dead end of the reefing line tied around the boom with a a bowline and other times I see it is not tied but rather around the boom and then looped around the boom again but now wrapped around multiple times around the first loop. Why is to done this way and what is best. As long as you are dead-ending somewhere at the boom and not up at the sail cringle itself there really is no wrong answer. Some like the Bowline being tied back to itself so that it cinches around the boom. Some sailors like to tie the bowline around the boom so that it slides. I personally like the latter. I like to think that once the cringle is down near the boom, now I want the bowline to slide aft (not cinch) in order to haul the sail out. Please explain the placement of the block or blocks needed to position the single reefing line at the reef tack. After exiting the boom running forward, where does the reefing line go next? I’m concerned about the reefed tack being pulled too far aft once the reefed foot is tightened adequately for high winds. Seems to me that one or even two blocks may be needed, one on each side of the mast at 45 degrees down from the tack. Some boats I’ve sailed on, required an additional line to be tied from the reef tack, around the mast, to hold the tack in correct position close to the mast. Tack hooks are sometimes too far aft to avoid stress on the first sail slide above the reef. It would seem to be even a bigger problem with single line reefing. I have a Beneteau 50 with single line reeling. The manual shows blocks on the reeling points at the aft end of the main but none are fitted. What type of block should be used and how should they be attached to the sail? Thanks for asking. Lately I’ve switched from using blocks to friction rings. See this link…http://www.antal.it/ENG/197_rings_with_loop_en. Depending on whether or not you have a webbing sewn on to the sail for the reef cringle or a pressed-in grommet, you would either lash the ring straight to the webbing and then pass the reef line through it (ideal). 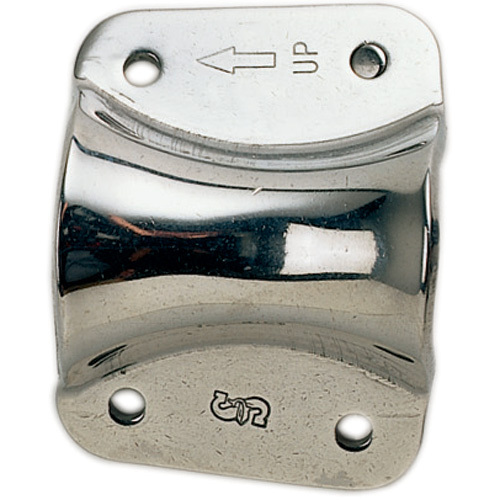 OR, in the case of the pressed-in grommet, you can purchase the loop and ring (as shown in link) and simply cow hitch a stainless ring, big enough so that it won’t fall through the grommet, likely 3/8″ round stock for strength, to other end of the loop to keep it captive on the sail. Alternatively you can use these same methods of attachment with a lightweight, strong ball bearing block like the one found here…http://www.harken.com/productdetail.aspx?id=4751&taxid=415. Just make sure that it meets the rope diameter requirements found on your boat’s reef lines. Lastly, IF the sail’s reef points are equipped with these pressed-in grommets and also feature a “Dog-bone”, which is a piece of webbing with a ring sewn into both ends to keep it captive on the sail (much like the loop and ring method described above), you can simply shackle a block to this “Dog-bone”. OR, you can cut it out and do the loop ring method mentioned above (preferred if equipped with Dog-bone). Hi, I have a slab reeking system with a reefing hook. My question: if I’m using the 2nd of my 2 reefs, do I need to reef the lower one first, and then secure the 2nd reef as well, or can I just use the 2nd higher reed to shorten my sail? Thank you. If you have reef lines rigged through both cringles then yes, you should be able to just go straight to the second reef and omit the first. when reefing , is it advisable to allow the uphaul slides to come off the mainmast track or do you keep them on? Either or is fine. I think it makes for a better looking reef to dump all of the slide below the reef that is being used. This minimizes bunching at the tack and allows for the slab to be tucked away nicer. It is more effort though. Therefore, I reserve this when needing to be reefed for longer stretches. Hi there in the U.S.! I have a plan to make a single line reefing system on my 43 year old Hallberg Rassy Monsun 31 berthed on the south coast of Sweden. She is now equipped with a well working slab reef. The idea is to draw the lines down to the cockpit by some drilling and fixing. I have discussed with people and they say that friction is the main problem to overcome. After extensive thinking and paper drawing, but still not testing, I have come to the following solution: The line starts with a knot in the outboard cringle in the sail. Down to a sheave near the rear boomend. Ahead to a sheave on the boom front. Up to a block in the sail inboard cringle. Down to a block on deck and then aft. That would make a sum of 4 blocks/sheaves and no passages through rings. The drawback would be that everything will be on one side of the boom. I dont know if that will make the sail inefficient in any way? My thoughts is that this construction would minimize friction. What are Your comments on this idea? That’s exactly how it’s done. 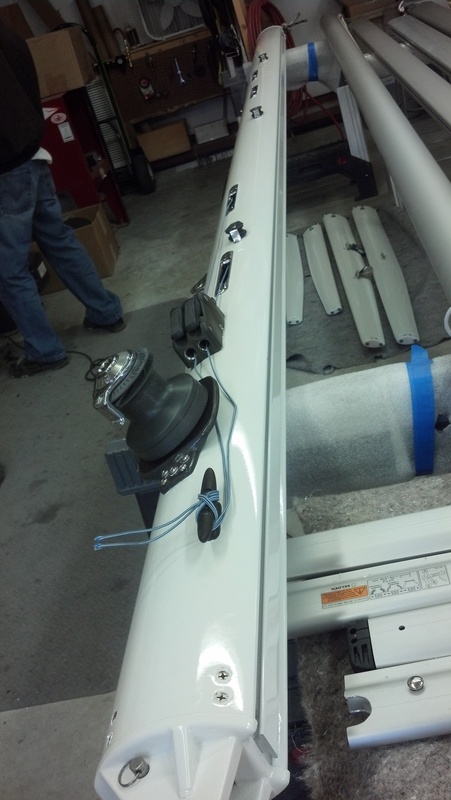 Just don’t forget to add the fairlead at the mast, below the gooseneck. See the drawing for single line reefing in the article. Thanks for the read and let us know if you need more thoughts. @ Howard: You didn’t REQUEST a third reefing point??! You probably don’t need it then so just ignore it. I have three reasons for a third reef, and it took months to figure out how to rig it for its intended uses. Assuming we are talking Bermudian/marconi rigs, the third reef is not in the same location as the usual “top reef” – you would (logically) only have a third reef for a high-aspect mainsail, the location reduces sail area to about that of a trysail. That third reef point is a lo-o-o-o-ong way up there, and even though my boom has room for a third line (the old main had a flattening reef) I didn’t want a reefing line going up there for a reef I will seldom use. One of my reasons for the third reef was to have an option for an emergency/temporary trysail, so my whole system had to be designed for that use (severe storm conditions and there is a problem if my trysail isn’t deployed instead), plus my personal needs (blue water singlehanding requires a fast and easy way to rig the reef clew ring in rough seas so I can quickly get away from the boom and off the cabintop, and simple enough it can be accomplished at night while I am tired or possibly injured). I did extensive research for how to hook up the reef clew ring on that third reef and didn’t find anything useful, so I designed a system that fulfills all my requirements. If there is any interest I might write an article about it for Ocean Navigator later this year. I have had a new mainsail made and the sail makers provided 3 reef points as opposed to the two specified, I have only two reefing lines. I questioned whether the spacing between the reefing points should be different for a two reef system as opposed to the three point system. they tell me that the distance between the reefing points would be the same, they would simply not provide the top most reefing point. Is this correct ? This questions is typically better suited for <a href=”http://www.chesapeake-sailmakers.com/”>a sailmaker</a>. Here are my two cents..I believe that the top reef is always at about the same location. The fabric weight can only handle so much and reducing sail beyond that would require a different (heavier) sail. The amount of reefs you have just break down the area below that top reef. Much like a transmission in a car, if you have a four speed you can still go 85 VS a 6 six speed, there are just more shift points before you get to 85. Does that make sense at all? I wouldn’t fret about not having that third reef line You can rig the two points in the sail that suit your most likely conditions. If you are on the Chesapeake you’d likely leave that third reef alone. What you can do is rig a small diameter loop between reef 2 and 3 so that if you need access to that last reef you can take the reef line that is slack and feed it up through the top reef via the messenger loop. Thanks for that, I follow your reasoning and it makes sense. However I doubt I’ll ever sail in Chesapeake bay, the Solent in the UK is my main cruising area!! Sweet! You’d better rig reefs 2 and 3 then ;). I love that we have readers in the UK. I would like to get another shuttle block for my Freedom 35 and see if it works for me. Can you supply me with one? Absolutely. 1st try going straight to the source. Sometimes they can be a bit difficult to deal with. If you have troubles please call our Bradford in the office and he will see to it that you get the exact part that you need. Hello I have a reefing system with a kind of blockers in the boom and I can’t find how it’s worked?? This system block in the 2 way!! I have some pictures to show you!! you say “hanging a block from the crinkle”, how? using a snap shackle, or sewing a block on so that it ‘hangs’ down , but then the line would all be on one side. confused ! Hi Ruth! Yes, you can hang a block or a friction ring (Google Antal friction ring with loop). There are a few methods to achieve this and yes, it would result in the line going up and back down the same side of the sail as it won’t pass through the sail anymore. One is to use a Dyneema loop with a ring hitched to it on one end (the ring keeps it captivated in the cringle) and hang the block or friction ring from it. Another is to have sailmaker sew a webbing loop to the sail and hang a block. Lastly, you can have the sailmaker sew in webbing with two rings, that is rigged through the cringle (much like the Dyneema loop and ring mentioned above) and hang the block from it…. called a “Dog Bone”. Can you please explain the correct way to secure the cringle to the Tack End Reef Hook without punching a hole in the sail? thanks. LOL well, it is slightly funny that you say that. I just went on a sea trial last week with a customer to use their new single line reef system, which omitted the old reef hooks. And guess what happened…one of the flakes of the sail, while reefed, caught on the stupid reef hook, which aren’t even needed any longer and poked a hole right in the sail. So, there’s my story, but if actually using the reef hook correctly it should not be doing that. 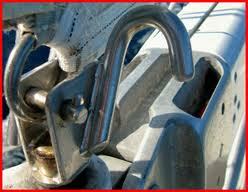 Simply lower the halyard, hook the cringle onto the sail and re-hoist the main. You’ll need to hold the cringle in place until the tension of the halyard does this for you. Using reef horns at the tack are only recommended if the main halyard winch and cleat are also on the mast so that you can manage both of them at once. If this is not the case and the halyard is led aft, then it will be a two man operation, OR re-rig the reef lines as single line reefs, OR re-rig the main halyard so that it is at the mast. Did I miss read the articles? Where does it say release the vang or kicker? The procedure I’ve encountered most would be. After making ready all lines and winches required. 1 Release kicking strap or vang. 5 Take up on reef line. Also hand pull tight all other reefing lines. 7 Trim vang and sheet. 8 Check over all blocks and wear points, use sail ties to secure reefed sail to boom. No miss read, I forgot to mention the vang. You are correct. Please note the addition and thank you for the comment. Hi, thanks. Am happy to have my name published for potential work! If you get my drift. David, we always welcome guest bloggers if that’s what you’re getting at please email jimmie@theriggingco.com.